With the latest updates for JobEngine & ClassifiedEngine, now you can use the WPML plugin to support multilingual for your business. In case you haven’t heard of WPML yet, it is a premium multilingual plugin which you can purchase at http://wpml.org/. This article gives you the detail instructions to install and configure WPML in JobEngine and ClassifiedEngine. For integrating WPML in your site, you need to use three required plugins above. - Visit WPML > Theme and plugins localization and check “Translate using .mo files” option. - Go to the lang folder in your theme (jobengine/lang or classifiedengine/lang) to copy the .mo file and paste it on your child theme folder. Please rename the copied language file to match the language code. E.g. VietNam -> vi.mo. This file is for translating the content provided by the theme. - Visit http://i18n.svn.wordpress.org/ to download the needed language file of WordPress and copy it in wp-content > languages. 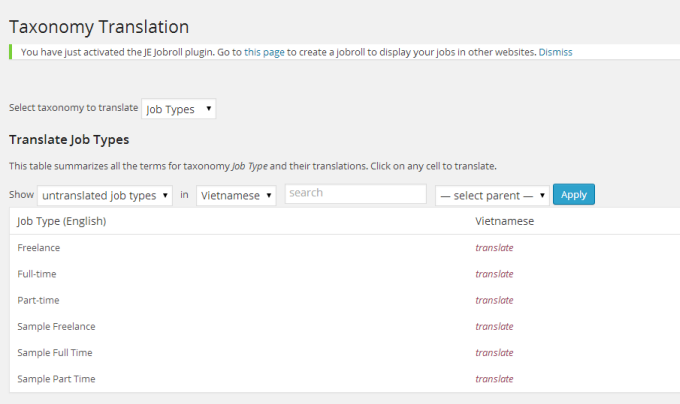 Since we want to support Vietnamese, we also get vi.mo from WordPress and put it in wp-content > languages. This file is for translating the other content provided by WordPress itself. The below image shows the statuses of the two needed language files: “file exists”. - You can translate each page into other languages by clicking the “plus” icon next to it. - Then, apply the translation for the page title, content, etc. and save it. - To edit the translation for a page, click on the “pencil” icon under that language. - Visit WPML > Taxonomy Translation. - Select the taxonomy to translate and start translating them as the below image. - Create a new menu for each version (Desktop and Mobile) and then assign them to the suitable menu location in your theme. - Click on “Translation” to translate your menu into the other language. E.g: Vietnamese. - Add the translated items (see #1 to translate these items) into this menu and you’re done. - Go to “ String Translation” to translate all other texts in the theme, such as widget, options, etc. - Search for a text in the theme and click “ translations” to add your translation. Check “Translation is complete” check box, and click “Save” to finish the translation. - All translated strings have the “ Translation complete” status as below. The above section should cover all parts in the theme that need to be translated and allow you to provide the site in different languages for your users.